Ronan Speech and Debate team state tournament attendees include: back row, Aurrora Watkins, senior; Coach Michelle Mallon; Kara Holmlund, senior; Sariel Sandoval, sophomore; and Taylor Jackson, sophomore. Krya Waldoch and d’Artagnan Dominguez are seated in front. 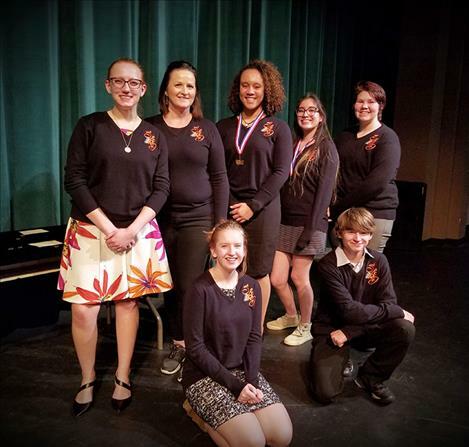 BELGRADE – The Polson and Ronan High School speech and debate teams recently competed in the two-day 2019 Class A Speech, Debate and Drama State Tournament on Jan. 25-26 in Belgrade. The Polson team earned a fifth-place overall finish. For Polson, Julia Reiners achieved an individual state title in Original Oratory. Davis Smith placed second in the Lincoln Douglass debate. Violet Anderson placed fifth in the Impromptu category. Taylor Bloomfield took fifth in Original Oratory. Joe McDonald and Hali Tyler placed sixth in Dramatic Oral Interpretation. Tayler Owners placed seventh in Humorous Oral Interpretation. David Castillo placed seventh in Dramatic Oral Interpretation. The Ronan team had a successful tournament with individual state placers. Kara Holmlund took sixth place in the Memorized Public Address category, and Sariel Sandoval brought home eighth in the Original Oratory competition.